August Hoffman built this handsome, two and a half story town house in 1893. The 45 year-old German immigrant was a bookbinder by profession. He was one of the many tradesmen who took great care to build well designed and crafted homes in South St. Louis. The estimated cost of construction of this home was $3,000. 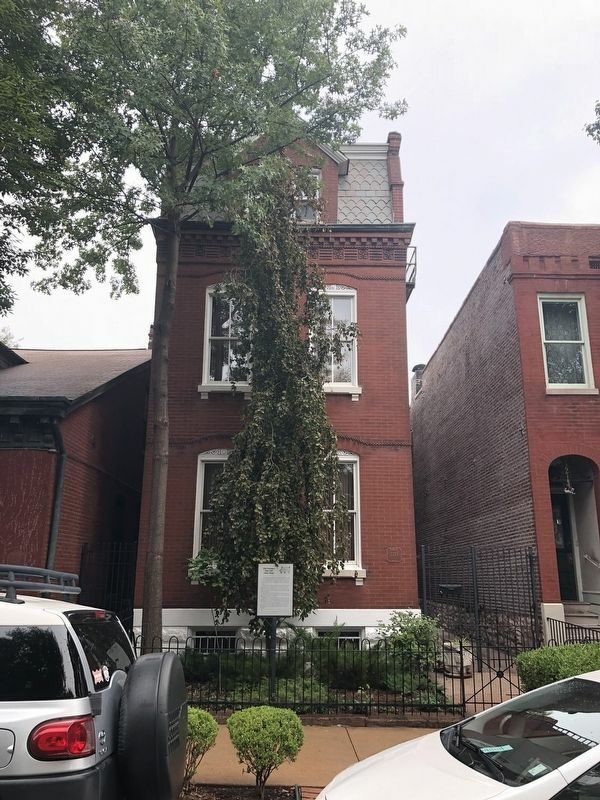 While Hoffman was planning and building his impressive home on Cherokee, another German South St. Louisan gave up on making his fortune in St. Louis. Otto Barby left his parents and sister in South St. Louis and headed west. In the spring of 1893, he took part in the last of the Oklahoma land rushes, which settled the Oklahoma panhandle. August Hoffman moved into his new house with his wife Maria, their son August, Junior, and daughters Frieda and Bertha. Their son became a jeweler, and moved to the adjacent home at 2217 Cherokee. The Hoffman family lived here and raised the next generation of their family on this block. The family called this place home, when in 1917, the United States declared war on the Central Powers in Europe, ensuring the defeat of Germany. and expanding his ranch until it covered tens and thousands of acres. 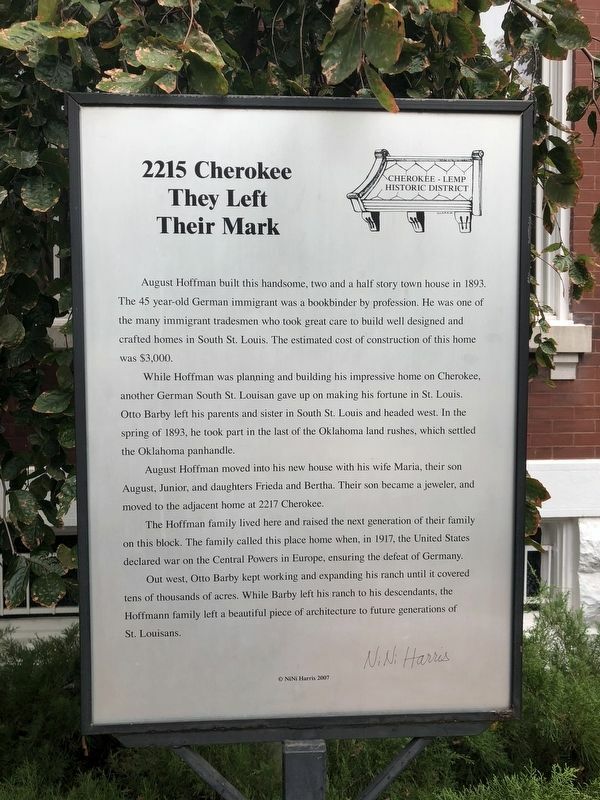 While Barby left his ranch to his descendants, the Hoffman family left a beautiful piece of architecture to future generations of St. Louisans. Erected 2007 by NiNi Harris. Location. 38° 35.588′ N, 90° 13.426′ W. Marker is in St. Louis, Missouri. Marker is on Cherokee Street east of Indiana Avenue, on the right when traveling west. Touch for map. Marker is at or near this postal address: 2215 Cherokee Street, Saint Louis MO 63118, United States of America. Touch for directions. Other nearby markers. At least 8 other markers are within walking distance of this marker. Bardenheier Row (within shouting distance of this marker); South St. Louis Architect (within shouting distance of this marker); 2225 Cherokee (within shouting distance of this marker); 2301 Cherokee (within shouting distance of this marker); 2201 Cherokee (within shouting distance of this marker); In 1860 A Scholarly Neighborhood (within shouting distance of this marker); The Birth of Antique Row (within shouting distance of this marker); Life In The Fifties (about 300 feet away, measured in a direct line). Touch for a list and map of all markers in St. Louis. More. Search the internet for 2215 Cherokee. Credits. This page was last revised on October 11, 2018. This page originally submitted on October 9, 2018, by Devry Becker Jones of Washington, District of Columbia. This page has been viewed 35 times since then and 4 times this year. Photos: 1, 2. submitted on October 9, 2018, by Devry Becker Jones of Washington, District of Columbia. • Andrew Ruppenstein was the editor who published this page.